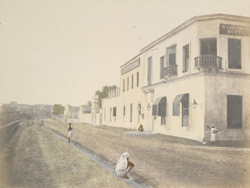 A Hand-coloured print of Johnson's Hotel, Chandernagore, from the Fiebig Collection: Views of Calcutta and Surrounding Districts, taken by Frederick Fiebig in 1851. Chandernagore, 32 km from Calcutta, was the site of the French East India Company's factory and remained under French rule until 1952 when a referendum made it a part of India. The town is unusual as it was under the French (1673-1952) even after the rest of India gained its independence in 1947. The architecture in the town still retains its French heritage.